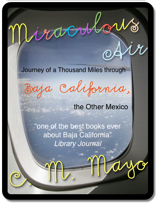 Dancing Chiva's mission is to provide and encourage writing to savor and books to save, focusing on Bajacaliforniana, esoterica, Maximiliana, works by C.M. Mayo, and works for writers. As a niche publisher, we bring our books directly to our readers. In other words, don't look for our titles in brick-and-mortar bookstores; you can find our books in selected on-line bookstores. Founding editor and publisher is C.M. Mayo, a member of the Texas Institute of Letters and he author of several widely-lauded works on Mexico, including the novel The Last Prince of the Mexican Empire (Unbridled Books), which was selected as a Library Journal Best Book of 2009 and published to wide acclaim in Mexico in a translation by Agustín Cadena as El último príncipe del Imperio Mexicano (Grijalbo Random House Mondadori). Her other works include Sky Over El Nido (University of Georgia Press), which won the Flannery O'Connor Award for Short Fiction. An avid translator, C.M. Mayo has also founded and edited the bilingual literary journal Tameme and Tameme chapbook series, as well as a collection of 24 contemporary Mexican literary works, Mexico: A Traveler's Literary Companion. (Whereabouts Press). 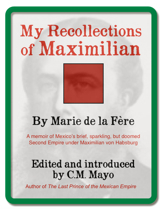 She is also the translator of the secret book by Francisco I. Madero, the leader of Mexico's 1910 Revolution, Spiritist Manual, which Dancing Chiva published in 2011, on its centennial, and brought again with an all-new book-length introduction in 2014 as the Indie Excellence for History Award-winning Metaphysical Odyssey into the Mexican Revolution: Francisco I. Madero and His Secret Book, Spiritist Manual. Why did you start Dancing Chiva? I love making books. I love writing them more than I like making them, which is why, though it occured to me many times, I did not start my own publishing firm. (About a decade ago, I did found a literary journal, Tameme, and from that, took some tough lessons in how much work it really is to edit, produce, distribute, and market a publication.) So why now? Because with the digital revolution, transaction costs have so fallen that everything changes. I own the ebook rights to not all but several of my own books, and I want to embark on the adventure of formatting / designing them myself. But more interestingly, in researching Miraculous Air (Milkweed Editions), my travel memoir of Baja California, and later, The Last Prince of the Mexican Empire (Unbridled Books), a novel about Mexico's Second Empire, I came across several books and other shorter works that deserve to be published / republished and yet do not, under the old publishing modelpaper printing, distributor, bricks-and-mortar bookstoreshave the potential to cover their costs. Some of these are so old that copyright has expired, so for me, the cost of publishing is little more than formatting and uploading. Of course, I'll add an introduction, images, and some other goodies. They will be scrumptious little books. I sum, though traditional bookstores and publishers are certainly not dead, they are not playing the overshadowing role that they did. For the kind of publishing I want to doebooks, print-on-demand paperbacks, and very small runs of signed editions (marbled paper, etc) I don't need to pay for freight and a warehouse. What a newfangled publisher needs is a website and a permission mailing lista base of customers who have provided their email because they want to receive announcements, special offers, and more. I think you'll find it worth your while to sign up for Dancing Chiva's newsletter. And if not, you can opt out instantly at any time. Have you given up on traditional publishers then? Not at all- With their expertise and scale, they can do things I do not aim to do with Dancing Chiva. As I said, much as I love making books, I prefer writing them; for this reason, Dancing Chiva is intentionally small scale at the level of administration and marketing. And I have to say, I have been very happy with my publishers, Whereabouts Press, Unbridled Books and, in Mexico, Grijalbo Random House Mondadori, especially. And they certainly know how to get the books in the bookstores! One of the great luxuries in life is a beautiful book: the heft in the hand, how it delights the eye, and it even smellsfresh paper, leatherdivine. Even as I build a larger library of e-books and declutter my bookshelves of all those yellowed paperbacks, I do want to keep certain beautiful books at handand I know I am not alone. Will you publish works in Spanish? 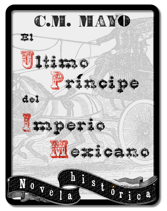 Yes, the first Dancing Chiva ebook in Spanish is El último príncipe del Imperio Mexicano, the translation of my novel The Last Prince of the Mexican Empire. I'm thrilled to say it's a superb translation, by Mexican novelist Agustín Cadena. UPDATE: El último príncipe del Imperio Mexicano is now available in Kindle. Why the name "Dancing Chiva"? 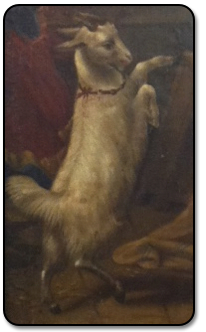 In the hallway into my office, I have an antique painting of a gypsy dancing with a little white goat. I was wondering what to call my company when I happened to glance at the little goatchiva (female goat in Spanish). It's a play on Dancing Shiva, the representation of the cosmic dance of the Hindu god (no disrespect intended), and very apt, for, to me, making books is a kind of happy little dance. Read more interviews with C.M. Mayo about Dancing Chiva here. And more interviews on other works here. of literary artists and literary arts institutions.